Never think about the story while you’re not working. When it’s time to work again, always start by rereading what you’ve written so far. For details on each point, visit openculture.com. CARDS: Courtesy of Paul Nebenzahl, whose poetry appears in the Silver Birch Press Summer Anthology (June 2013). In the above photo, author Ernest Hemingway (left) dines with director Frank Capra at the Paramount Studio commissary in 1941. 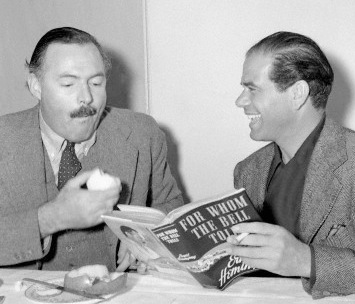 Capra holds a copy of Hemingway’s then-latest novel — FOR WHOM THE BELL TOLLS (1940). Set during the Spanish Civil War (1933-1939), the book became the basis for the 1943 film of the same name starring Gary Cooper and Ingrid Bergman — actors that Hemingway selected for the roles. Whether or not Capra was pitching his services during this lunch with Hemingway, he did not end up with the director’s slot — instead, Sam Wood assumed the role because shortly after this photo was taken, the United States entered WWII. Frank Capra served as a Colonel in the U.S. Army Signal Corps, where he remained during the war years (1941-1945) making a variety of military films, including many shot during combat. Hemingway spend much of WWII as a war correspondent in various parts of the world. Out on the lawn a clatter arose. I got out of bed and went to the window. I opened the shutters; then I threw up the sash. The moon shone on the snow. The moon gave the lustre of mid-day to objects in the snow. There was a miniature sleigh in the snow, and eight tiny reindeer. A little man was driving them. He was lively and quick. He whistled and shouted at the reindeer and called them by their names. Their names were Dasher, Dancer, Prancer, Vixen, Comet, Cupid, Donner, and Blitzen. I pulled my head in out of the window and listened. I heard the reindeer on the roof. I could hear their hoofs pawing and prancing on the roof. “Shut the window,” said mamma. I stood still and listened. Note: Ernest Hemingway came to prominence in 1926 with the publication of his novel The Sun Also Rises. 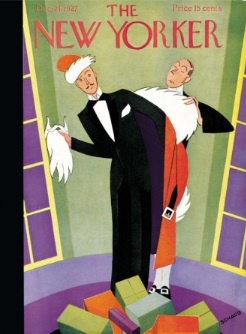 By Christmas of 1927, the book — and Hemingway’s style — had gained enough renown to inspire Thurber’s Yuletide parody. 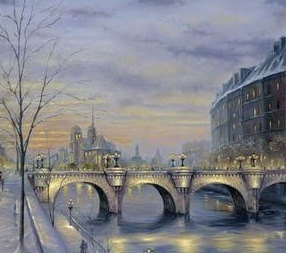 …Paris with the snow falling. Paris with the big charcoal braziers outside the cafes, glowing red. At the cafe tables, men huddled, their coat collars turned up, while they finger glasses of grog Americain and the newsboys shout the evening papers. Note: Ernest Hemingway wrote “Christmas at the Roof of the World” in 1923, when he was living in Paris and working as a correspondent for the Toronto Star. 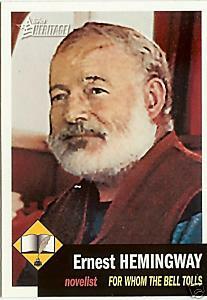 Find the story in BY-LINE ERNEST HEMINGWAY: Selected Articles and Dispatches of Four Decades, available at Amazon.com. Excerpt from a 1958 interview George Plimpton conducted with Ernest Hemingway, published in The Paris Review. Hemingway: It depends, I rewrote the ending to A Farewell to Arms, the last page of it, thirty-nine times before I was satisfied. 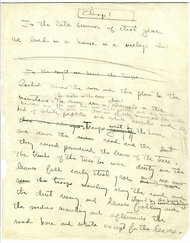 Illustration: Page from Hemingway’s first draft of A Farewell to Arms (1929). 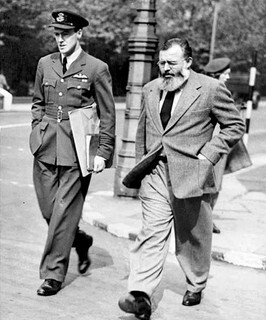 Photo: Roald Dahl (left) and Ernest Hemingway (right) in London during 1944. NOTES ON THE PHOTO: As far as I’ve been able to learn, no one knows why Dahl and Hemingway were together in London during WWII. Dahl, a member of the British Royal Air Force, worked as something of a spy during the early war years—when Britain was fighting Germany and hoping the U.S. would enter the conflict. In this period (1939-1941), Dahl was stationed in Washington D.C., and attended social functions with politicians and other dignitaries, hoping to learn useful information about U.S. plans vis-a-vis the war. At the time of the above photo, Dahl was 28 and Hemingway was 45 (though he looks much older). At first, I was puzzled when I looked at this photograph — thinking it couldn’t be Hemingway because “Papa” wasn’t that short. Then I realized that Roald Dahl must have been well above average in height to make Hemingway appear diminutive. Further research revealed that Dahl was 6’6″—while Hemingway was 6 feet tall. 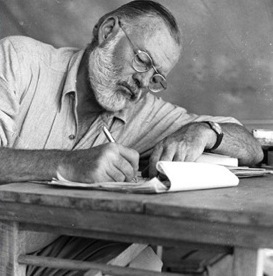 At this point in his career, Hemingway was a world-famous author and had written three of his most important books — The Sun Also Rises, A Farewell to Arms, and For Whom the Bell Tolls – while Dahl had not yet written anything of note (Random House had published his children’s book entitled The Gremlins in 1943). Perhaps the young intelligence officer and aspiring author (Dahl) wangled a meeting with the old lion (Hemingway), hoping to gain some writing advice or just bask in the presence of the great author. Marley was dead to begin with. Ten years dead. He had carried every weight the world could lay upon a man, but in the end he died all the same – in fact, made his own exit in his own time – and did so without complaint. He wanted more. There was none. And so he departed. He was cold in the ground, his eyes closed to all things, his feet pointed east. Scrooge no more thought of his old friend, however, than he did of his second divorce or of the time (on a Christmas Eve, just like this) at Havana’s Floridita when he’d matched drinks one-for-one with a man who was a coward. Each downed glass after glass of rum; neither got drunk. 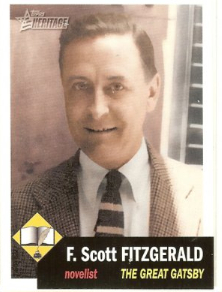 The coward, who claimed to be a good Catholic, was long gone. Over the course of six decades, one left much behind and could count many graves. 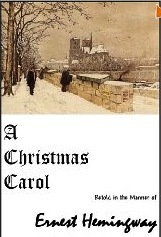 But, if one was honest and unflinching, he understood that there was no tragedy in this. 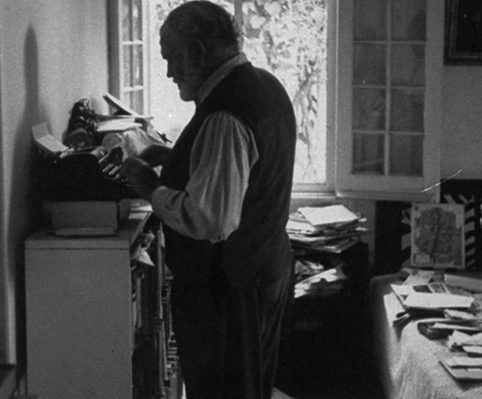 …on the top of one of these cluttered bookcases—the one against the wall by the east window and three feet or so from his bed…Hemingway has his “work desk”—a square foot of cramped area hemmed in by books on one side and on the other by a newspaper-covered heap of papers, manuscripts, and pamphlets. There is just enough space left on top of the bookcase for a typewriter, surmounted by a wooden reading board, five or six pencils, and a chunk of copper ore to weight down papers when the wind blows in from the east window. 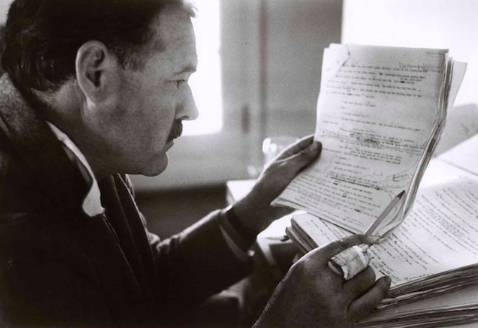 Read “Ernest Hemingway: The Art of Fiction” at the Paris Review.